Today, we are offering a brand new and unworn Made in Germany Nomos Tangente Neomatik 39, Ref. 140, with all boxes and papers and full warranty. 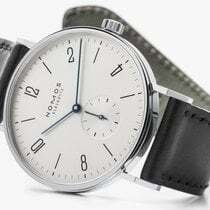 This is a genuine Nomos Glashütte watch and we guarantee authenticity. This is a rare watch for the ambitious entry level watch aficionado, impeccable in manufacturing and finish and a true statement piece for beginning and intermediate collectors. Current Retail price for this model is $3,780. Description: For those who value straightforwardness as much as precision: Tangente neomatik 39 is a stylish accompaniment to the working day. The tempered blue hands on the white silver-plated dial look great whether with a suit or smart casual attire. 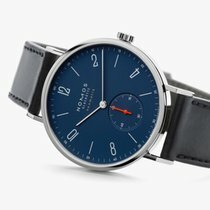 Large, composed—and as slender as a hand-wound watch, thanks to the NOMOS automatic movement DUW 3001. Unusually slender, highly precise, and equipped with the NOMOS swing system (which ensures outstanding accuracy): the automatic caliber DUW 3001 is setting new standards. And lets automatic watches remain wonderfully elegant. Designed in Berlin, elaborately produced, and polished by hand, the NOMOS winged clasp exudes elegance through its beautiful minimalism. Exclusively for the watches of our neomatik series: our remborde strap, crafted from Horween Genuine Shell Cordovan. 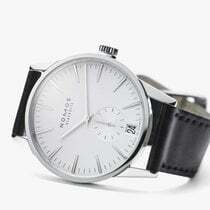 This leather is thick, smooth, and robust—which makes these NOMOS straps particularly long-lasting. Our automatic timepieces come in an elegant leather wallet—the perfect companion for weekend trips and world tours. The black, full grain leather is wonderfully soft and protects your timepiece beautifully.